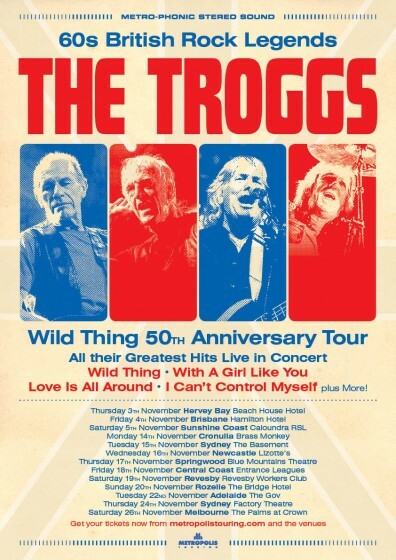 “Wild thing, you make my heart sing!”… 60’s British Rock Legends THE TROGGS finally return to Australia this November to celebrate the Wild Thing’s 50th Anniversary by performing all their Greatest Hits – Wild Thing, With a Girl Like You, I Can’t Control Myself, Love is All Around plus More! The piano player starts up, an accordion bursts in, and by osmosis of memory into reality, the room is filled with a cloud of collective audience thoughts of France. Personal artistic journeys for one, a package holiday with Eiffel tower earrings for another, access to the iconic baguettes and berets for those who haven’t been. This is the invocative power of Jacques Brel, a Belgian musician and artist who created his songs in the language of love. Never heard of him? He is mostly known in the English speaking world through his songs which have been translated and interpreted, but performers of these works include Frank Sinatra and The Dresden Dolls among many others. John Waters’ memories of Brel and his works start from a hitchhiking experience in France where Waters overheard a street musician playing a song whose passion captivated him. The song was Brel’s. 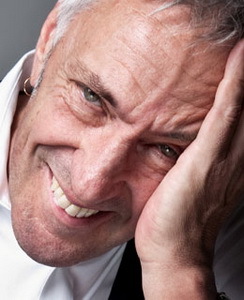 Since that time Waters has embellished the original experience by seeing Brel perform live, and Waters now tours his own shows of Brel’s works. He performs them “as often as I can” and they are brought to Brisbane tonight as part of QPAC’s week long cabaret festival. A broad selection of musicians have been gathered to help Waters convey the magic of Brel. The singer performs with an accordionist, pianist, percussionist, saxophonist and two guitarists, some of whom jump to other instruments as the songs necessitate. Waters moves like a marionette to their sounds, arms extended, hands waving, rake thin grey suit legs twisting and flicking at the mercy of his tapping, rolling, springing feet, French phrases spilling indiscriminately from his lips. He performs the first song with no introduction, using humorous gestures to convey that the song, in part at least, is about wine and women. Fortunately for those of us who do not speak French, the rest of the songs are introduced by Waters’ summary and interpretation of their lyrics. Waters, who has a background in acting as well as song (most recently, he was part of the TV movie UnderBelly: The Golden Mile) delivers these synopses alternatively in humorous, dramatic and irreverent ways, and the stories become as much a part of the show as the music is. The first tale we hear is about a man, losing his virginity. In the army. In the Mobile Military Brothel. Waiting in line for the occasion, he listens as his commander yells out ‘Next!’ at irregular intervals until, shuffling forward naked except for a towel, his first foray into the carnal world is anointed with a case of venereal disease. “Looking back, the man sees his place in the world ‘Next!’, as one of the endless line of the following and the followed ‘Next!’, never to be number one.” It’s not easy to tell how much of the poetry is in the song, and how much comes from Waters’ skilled translation. The song and sounds that follow are more light and jaunty than seem fitting given the tale told beforehand. The next tale speaks of love, not new love but old love, the love between people who know all of each other’s tricks, how the games are played and how they end, and yet still retain play and passion “knowing its okay to grow old, but not to grow up”. This tale is told with musical worship, all minor scales and melancholic yearning chords, complemented by the French verbs and accents falling from Waters’ lips. except for a swelling of sounds and emotions at the appropriate places in the often emotional tales. This was most evident in a song which Waters described as “Renoir on acid” – imagine a painter on drugs transforming the colours into words and rhymes. The music was a maelstrom, starting with a funny waltz introduction before invoking rich brass sounds, becoming forceful and frantic and building to a raucous, drunken finish as Waters hurtled his voice into the crowd. Waters performing Brel was mind expanding. Experiencing songs without the burden of lyrics but with a poetic description of the intent was a unique experience which allowed both the beauty of the tales and panache and verve of the music to be appreciated separately. This was enhanced within the jazz styled form of following the story with the music rather than constraining it with choruses. Waters combined the best of his acting and voice talents to present an intriguing, amusing and enjoyable evening of cabaret. Chugg Entertainment and David M. Hawkins are proud to present the long awaited return of award winning superstar Liza Minnelli. Bringing her unstoppable Minnelli magic to Australia, Liza will tour nationally during October in an unmatchable concert performance. Based on her current hit Broadway show “Liza’s At The Palace”, the evening will feature an incomparable Minnelli songfest including many of her personal favourites and signature hits. Along with a twelve-piece orchestra led by conductor/drummer Michael Berkowitz and pianist/musical supervisor Billy Stritch,the performance will feature many of Liza’s showstoppers such as “Cabaret”, “Maybe This Time” and “Theme From New York, New York” – all written especially for her by the legendary Broadway song writing partnership of John Kander and Fred Ebb. Directed by Ron Lewis, this concert performance of almost two hours duration (with interval), will be full of personal stories, anecdotes and heartfelt reminiscences. Liza Minnelli was born in Los Angeles into show business royalty. With her mother Judy Garland and her father the Award winning director Vincent Minnelli, her’s is the only family where both parents and child have won an Oscar. Her god parents were Ira Gershwin and Kay Thompson. Liza made her screen debut in 1949 as a toddler with her mother in the MGM movie musical In the Good Old Summertime.